The vanguard university production is based on four fundamental pillars: ideas, talent, quality infrastructure, and institutional support. Each one of these pillars fulfills specific and necessary purposes, regarding the growing sophistication and production of knowledge on a global scale. Technology is truly making new teaching and educational approaches possible. But the costs of equipment administration, infrastructure, implementing patches, software upgrades, making security updates, installing new applications, and technical support and maintenance are interfering in these efforts. mynetworks offers highly specialized services to applied computer center management to help teaching institutions face these challenges. The concept is simple: generally, mynetworks, is always jointly present with your teaching staff, analyzes technologies, solutions, prepares the planning, assembles, and manages the applied computer centers in your teaching institution, based on your needs and pedagogic planning. You rent the managed and services technological infrastructure – computers, laptops, specialized data storage and telecommunication equipment, printers, projector (datashow), interactive digital board, network, software, support and maintenance services, etc. – everything is ordered based on demand and low initial investment, in the “pay-by-use” model. State-of-the-art– We are prepared to supply solutions to applied computer centers for the broadest fields of research and knowledge – high performance infrastructure and virtualization, data storage systems, networks, and telecommunications, cloud computing, structured cabling and telephony, among others. You specify your needs and mynetworks will plan and select the best solution to meet your needs, including guaranteed evolution and constant updates. Low initial investment – Economic challenges nowadays require institutions to preserve capital and make decisions on investments supplying rapid returns. As you do not need to invest in equipment and software, our services results in substantial savings for your teaching institution. This frees the capital of the establishment, making it possible to utilize this money for something much more advantageous – growth and staying ahead of competitors. Pay-per-use– It is possible to notice the saving from pay-per-use for using the IT equipment instead of purchasing it. Besides that, our services are metered, so you only pay for what you use. 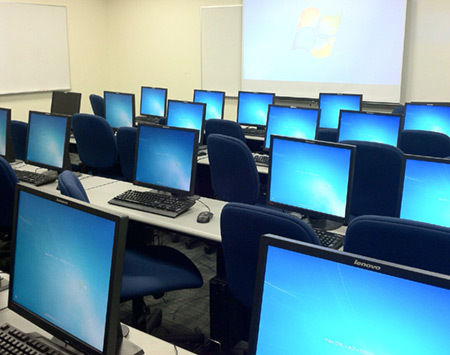 Scalability – makes it possible for your teaching institution to adjust to the size and number of labs and available stations in the computer centers based on demand, easily and quickly, as this optimizes faster expansion for your teaching establishment. Costs on specialized IT personnel, maintenance and support costs will be greatly reduced, since our product aggregates all the support and maintenance infrastructure services at applied computer centers, into a guaranteed model based on service level agreements (SLA). You only pay the contracted monthly price and nothing more.